Kitchenettes, flatscreen LCD televisions, heavenly beds and exclusive-to-lebua Bvlgari amenities are among the items that grace the suites at The Tower Club at lebua. But you’ll have to step outside the suite to find its coolest feature—the balcony. Every Tower Club suite is located between the 51st and 59th floors of the State Tower. And every suite has its own balcony. As far as Spot Cool Stuff can determine, no other hotel in the world has private guest room balconies as far off the ground. (The Sorrento in Hong Kong has private balconies on the 70th floor, but the building is purely residential.) The Tower Club suites’ balconies are so high that the hotel makes you sign a waver before they’ll unlock the door. Once we got access to our balcony, we found ourselves wandering out to it every time we entered our room. The view was breathtaking. Sometimes—such as when the wind picked up—literally so. Check out the panorama below to get a snapshot sense of the view. Constantly changing light and weather patterns made the scene from our balcony seem a bit different each time we looked. Taken with a Sony Nex-5 on Panorama Sweep mode. Click to see full image in a new window. Warning: big file! The Tower Club at lebua does not advertize itself as an all-inclusive hotel. But it almost could. While many Bangkok luxury properties hack away at their guests’ wallets by charging for all manner of amenities (We’re looking at you, Oriental Hotel), a stay at the Tower Club at lebua includes lots of freebies. In-room internet is free. Breakfast is free. Lunch, High Tea and drinks (both alcoholic and not) in the Club Lounge are free. Go ahead and raid the in-room mini bar; you won’t get charged. Unlimited viewing of on-demand movies is complimentary too. Spot Cool Stuff is well aware that the cost of all those perks is folded into the price of the room. But there’s something about so many “free” amenities that makes a stay at the Tower Club feel especially relaxing and decedent. 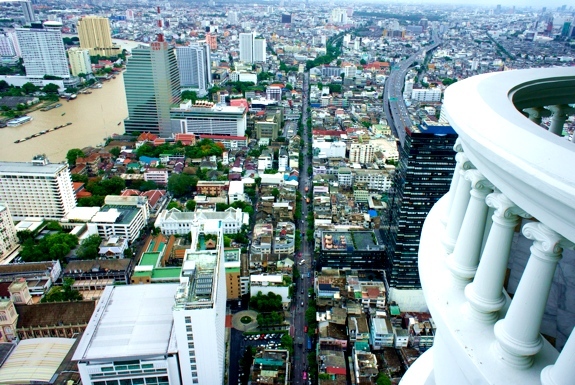 One-bedroom suites at the The Tower Club at lebua generally run around $175 per night for a city view. For an extra $25 you can upgrade to a river view—arguably not worth the cost considering you can take in the river from one of the rooftop bars or restaurants (see below). 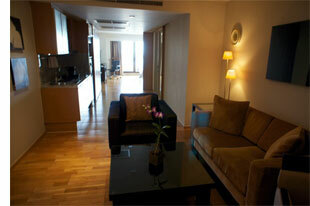 Two- and three-bedroom suites are available also. The two-bedroom suites offer more than double the space of two one-bedroom suites, but then they cost more than double, too. The better deal is the massive three-bedroom suite. 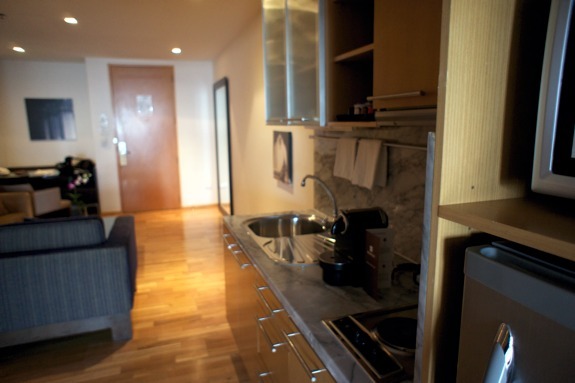 Its 266 square meters (2,863 sq ft) of space includes an over-sized living room, private clothes washer and dryer, and a kitchen that in itself is larger than most hotel rooms; upon request the hotel chef will come to your suite and prepare a personalized meal for you. The lebu hotel was the filming location for several scenes of the The Hangover Part II movie. The best feature of that mostly dismal sequel is that it inspired the Tower Club to develop a Hangover Suite. This special three-bedroom suite is adorned with photographs from The Hangover Part II movie. More importantly, it comes with a large mini-bar stocked with complimentary alcohol plus alcohol that’s strewn about the room. One hotel employee joked to us that staying in the Hangover Suite makes getting drunk obligatory. 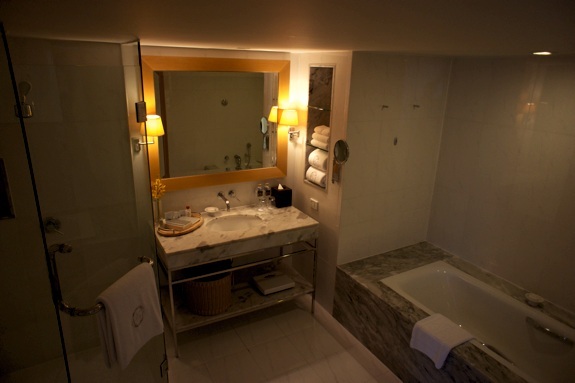 Hopefully, guests won’t wake up the next morning to find a tiger in their suite’s bathroom. Long time Spot Cool Stuff readers may remember our review of the Sirocco restaurant and Sky Bar. The Tower Club at lebua is the hotel on top of which both of those sit. 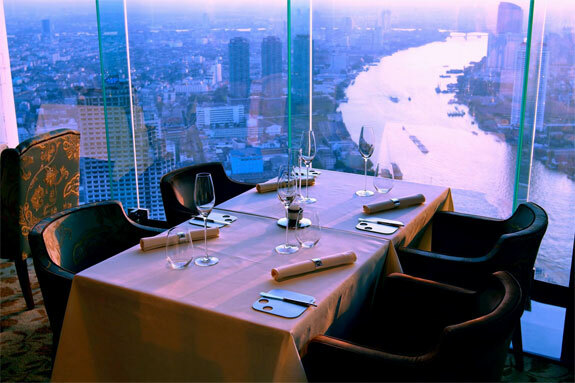 The Sirocco, above the State Tower’s 61st floor, is the world’s highest open air restaurant. There’s also an indoor fusion restaurant up there, the Mezzaluna. Foodies will prefer the Mezzaluna—the atmosphere is too old-school stuffy for Spot Cool Stuff’s taste but the six-course chef’s tasting menu with wine pairings is truly outstanding. The Sirocco has a more fun and exotic vibe, especially on a nice night when the jazz band is playing. However, the Mediterranean offerings don’t quite match the culinary adventures that is a meal at Mezzaluna. Both restaurants require advance reservations. For drinking, the Sky Bar offers a superlative experience—a round LED bar of changing colors juts out daringly from a corner of the State Tower. When the clouds allow a view of the sunset, there are few better places in Bangkok to be than the Sky Bar. There’s a second outdoor bar up the roof too: Distil. Distil has the advantage of having cushiony lounge seating but the views aren’t as dramatic as those from the Sky Bar. Note that if you show up in the lobby and say “I’d like to go up to the roof for a drink,” they’ll take you to Distil. So specify the Sky Bar if that’s where you want to go. The lebua’s bar and restaurants are all open to the public and are an ideal way to get a taste of the Tower Club’s views without staying there. The Tower Club at lebua isn’t particularly oriented towards any of these three features. The fitness center is on par with other business class hotels. It includes weights, cardiovascular and resistance machines. Thankfully, the room is well air conditioned. The spa, such as it is, consists of four massage rooms. Several massage types are offered, including deep shoulder and Oriental foot massages, but no other sorts of spa treatments are available. The pool abuts a cafe and makes for a scenic breakfast backdrop. For swimming in the pool is less optimal. It is a bit small and, being in the shadow of a skyscraper, doesn’t get much direct sunlight. The Tower Club at lebua towers over the river end of Silom road. The night market bargains, bars and debauchery of Patpong are an inexpensive ten-minute taxi ride away. It also takes around ten minutes (of sweaty walking) to get to the nearest Chao Phraya river ferry pier or BTS Skytrain station. 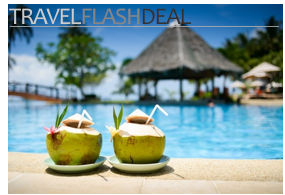 (The hotel runs free shuttles to the later every half hour). 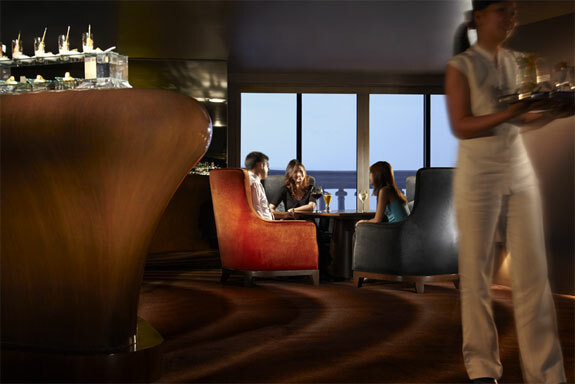 All that makes the Tower Club well located for a mix of sight seeing, shopping and nighlife-ing. That said, if you are especially oriented towards one of those activities there are hotel choices better located. Lookin’ for my BKK splurge. How far is this from Kow San Road? Nearly half way across town. About a 30~60 minute taxi ride (depending on traffic). The cheapest (and probably quickest) way from KSR is by Chao Phraya river ferry. 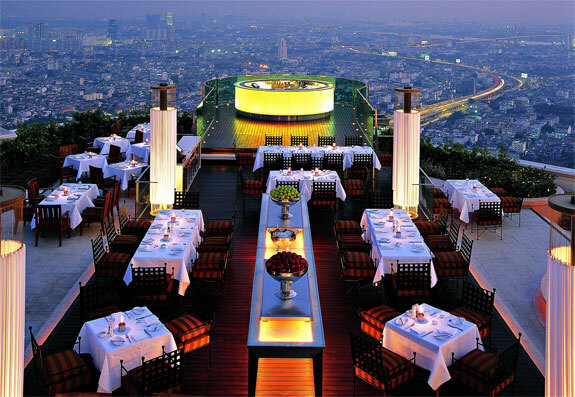 The lebua is certainly worth the splurge. Looks good. But I always stay at the Dusit Thani. We like the Dusit too. Compared to the lebua, it definitely has the better view. And it is closer to the Patpong night market. Still, we prefer the rooms at the lebua. And, of course, the lebua has the better views.